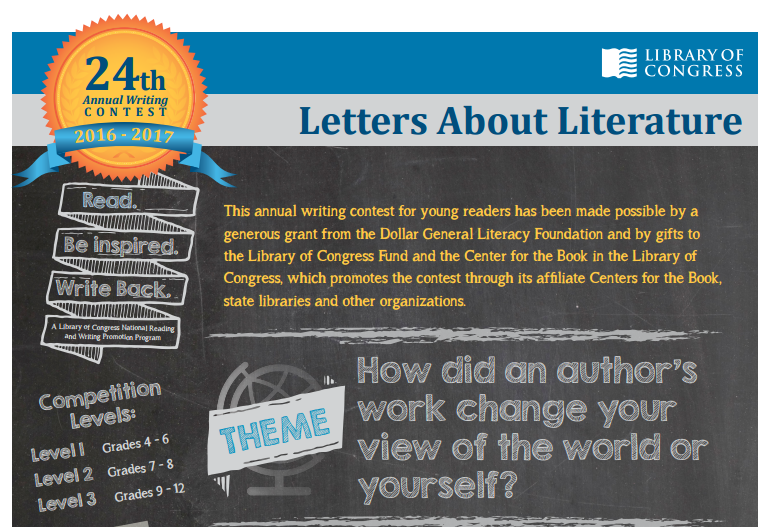 Students nationwide are invited to share their most influential literary experiences through a contest that asks them to write a letter to an author and explain how his or her work changed their perspective of the world or of themselves. To enter, students write a personalized letter to an author, living or deceased, from any genre whose work has made an impact. Rather than summarizing the book’s plot, contestants are encouraged to express the effect the book has had on their lives in a personalized, conversational tone. Students will be included in state-level and national-level competitions with the same letter. First place state winners in each age bracket will advance to the national level judging. A panel of national judges in the Library of Congress will select one National Winner to receive a $1,000 cash award. Submissions are welcome after November 2nd. The deadline for individual submissions is January 9th for 4th-6th grades. To review the official contest rules and guidelines, please visit http://www.read.gov/documents/LAL16-Guidelines.pdf. Mr. Durden will have paper copies available in the classroom as well. ​Mr. Durden is willing to coordinate and mail all entries from students he receives by Tuesday, January 3rd (Bookman Beacons) and Wednesday, January 4th (Langford Labs); this will allow him time to check entry forms and ensure the package is mailed in time to receive the required postmark. This is not a required activity, but we do encourage students to participate if reading and writing are a big part of the enjoyment they take in learning.